Pioneers in the industry, we offer polythene garment cover, clear polythene garment cover and shirt bags from India. We are amongst the most prominent enterprises, actively engaged in offering Polythene Garment Cover. The offered Polythene Garment Cover offers a protection from moisture while your cargo container is on the move, it that provides flexible protection against damaging humidity and moisture during intermodal transport. Our Polythene Garment Cover is a desiccant packs made from natural clay minerals with Gelling polymers. In the containers can always be kept lower than the environment temperature outside. Being a client centric organization, we are offering Clear Polythene Garment Cover that is manufactured using superior quality polyethylene. Our provided bag is highly acclaimed by the dry cleaning shops to pack cloths after dry cleaning. 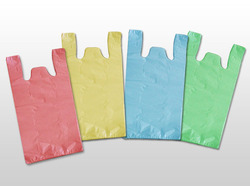 Additionally, the offered poly bag is available in various customized forms to cater specific demand of our clients. In order to meet with budgetary requirement of our clients, we have reasonably priced our products without compromising with quality.